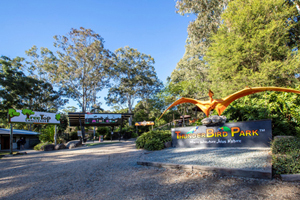 “Thunderbird Park” on Tamborine Mountain between Queensland’s Gold Coast and Brisbane is an adventure packed destination. Come for the day or stay and play, this 112-hectare rainforest property is ideal for day trips and longer holidays. Discover ancient rainforest and a raft of exciting adventures. 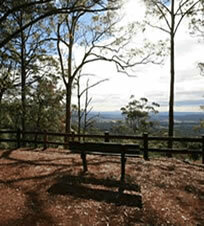 Take the “TreeTop Challenge”, Australia’s longest and highest adventure ropes course. Climb cable ladders, balance on rope bridges, catch a flying fox, crawl through tunnels, manoeuvre on suspended trunks or jump from great heights. 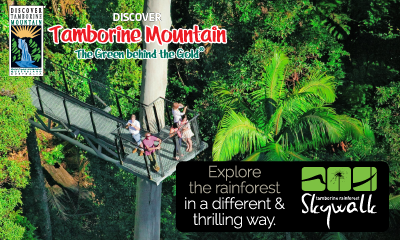 TreeTop Challenge has 72 jungle games and 11 flying fox rides. 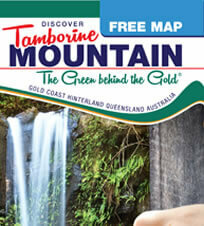 Go horse trail riding through the rainforest or play laser skirmish in a jungle village setting. Thunderbird Park has the world’s largest deposit of gemstone-filled thundereggs formed when dinosaurs roamed the earth. Find treasure and meet Rockodile, the local rock expert. Explore the natural bushland along the walking tracks, swim in the resort pool or natural rock pools, play mini golf, volleyball, basketball or tennis. Stay in a stylish private lodge, choose a contemporary room, opt for the backpacker bunkhouses or a shaded campsite. Have a barbecue breakfast with the birds, enjoy a pizza from the wood-fired oven on the terrace or dine in the Rainforest Grill, Restaurant and Lounge Bar.